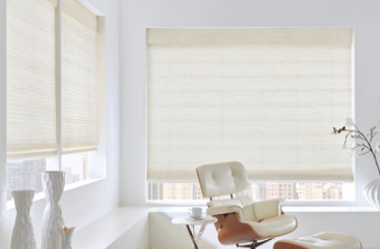 At the Blind & Drapery Showroom, we offer the largest selection of Woven Wood Shades in Agoura Hills, Calabasas, Westlake Village, Malibu, Thousand Oaks and Ventura County. 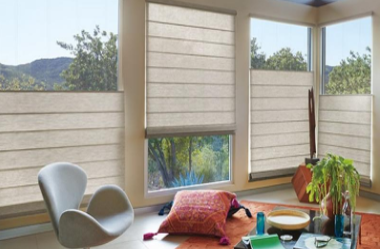 When it comes to window shades, no brand combines the beauty of nature with the elegance of high-end design like Hunter Douglas’ woven wood shades. Hunter Douglas’ innovative and eco-friendly materials – and high tech operating systems – set them apart as the industry leader in woven wood shades. Follow the Malibu Window Shade Trend! We service valued clients across Los Angeles and Ventura County. But when it comes to “trend-setters” we know that our movie star, millionaires, and style mogul clients in Malibu know what’s “on trend” in the world of home decor. While we never “name names”, recently we have seen a trend among our Malibu customers who are choosing Hunter Douglas roman and woven wood window shades for their Malibu mansions. Hunter Douglas window shades are indeed the fashionable choice for homeowners who want nothing but the very best. Whether you seek a state-of-the-art, motorized, smart phone operated window shade solution – or something more modest – Hunter Douglas offers a wide range of materials, operating systems and price points. Let us come to your home and show you our wide selection of Hunter Douglas, and many other brands, window shades – and bring your personal home design dreams to life! Hunter Douglas Provenance® Woven Wood Shades are hand-woven from light-filtering reeds, grasses and woods. Nothing else brings the beauty of nature right into your home with such elegance and grace. Perfect for Malibu ocean views, or Topanga’s mountain vistas, these naturally sourced materials blend with nature, rather than competing with it. Strong, durable, sustainably sourced natural materials – coupled with Hunter Douglas’ superb quality and excellent craftsmanship – ensure you woven wood shades never stretch, bow, break or fade. Your choice of superior quality linings provide the degree of opacity and light control you desire. For the ultimate in “privacy with a view” let the sunshine in with optional top-down-bottom up operation. Customizable contrasting, coordinating or complementary valances and edge bandings offer you endless possibilities to match any home’s décor by combining textures and colors. And PowerView® Motorization is also offered on these stunning shades for wireless operation from your smartphone or tablet. The Hunter Douglas Alustra® Collection of Woven Textures® offers an innovative alternative to woven woods and solar screens. Distinctive light filtering fabrics blend unique fibers and sophisticated design to create elegant, yet energy-efficient window treatments. Hunter Douglas selection of superior linings are available in your choice of light-filtering or room-darkening opacity. Additionally, the linings operate independently from the shade – offering privacy, light control and insulation from the sun and elements. Optional top-down-bottom-up operation gives you even further control over light and privacy – allowing the sunshine in while keeping prying eyes out. Available in widths of 15″ to 96″ and heights of 20″ to 120″ these versatile shades are suitable for windows small or large. And, you can coordinate doors and windows with the same Woven Textures® fabrics – available in the Alustra line of ® roller shades and vertical blinds. PowerView® Motorization, with smartphone & tablet operation, is also offered.